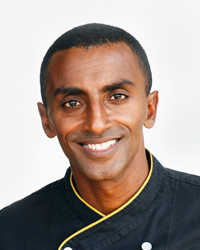 Marcus Samuelsson, the superstar chef behind restaurants in New York, Chicago, Southern California and Sweden tells Food & Wine about his time-intensive fried chicken, the best theater to visit in Harlem and how to get guests dancing at a dinner party. At Red Rooster people love our fried chicken. It takes three days. First we cure it, then we marinate it in buttermilk and coconut milk, then we then fry it on low heat, then on high heat. It comes out golden and crispy, it’s one of the most popular things on our menu. White Heat, by Marco Pierre White. I think my mom or my sister bought it for me for some holiday when I lived in Sweden. Just the visual aspect of him being a young chef, and not looking like any other chef, I related to that as a black chef. Obviously he wasn’t black, but he offered a difference. When the book came out in 1990, he wasn’t even 30 and had two Michelin stars. Yet he wasn’t French, he was English, he had long hair and was pissed off all the time. I was drawn to all of that. How to make Swedish meatballs. They’re so comforting. The best have equal parts pork, beef and veal—ground pork shoulder for the fat, then beef and veal for flavor. Then we generally add onions, some bread crumbs, honey as a sweetener, and then I like to add a pinch of berbere spice mix. After you shape them, it’s a good idea to put them in the freezer for about 15 to 20 minutes to firm them up; if you fry the meatballs at room temperature, they sometimes fall apart. Cook them first on low heat until they’re cooked through, then crank up the heat to give them a little color. Set them out on a platter with mashed potatoes or braised cabbage and let everyone serve themselves. I like to teach Ethiopian tribal dance moves during my parties. Most of my friends aren’t Ethiopian, so it’s pretty memorable for them. If you Google “Ethiopian tribal dance,” you’ll see what I’m talking about. The moves are the same for men and women, and everyone looks silly, so it’s a fun icebreaker. What are 5 cool places in New York City where you like to take out-of-town friends? Obviously, the Apollo Theater in Harlem is amazing. Sometimes my Swedish friends are surprised when they start booing people off the stage, but that’s always a good time. The High Line is beautiful any time of the year. I love to walk the whole length of it; it gives you a totally different look at the city. I always feel lucky to live in New York afterward. Nothing beats hitting a museum. MoMA (the Museum of Modern Art) can get crazy crowded, but I can still walk around at my own pace. I’m such a huge fan of Lichtenstein, Warhol, Basquiat, and they’re all there. For Swedes, stand-up comedy is something very American, and when my Swedish friends come here, it’s one of the first things they want to do. I’ll often take them to Caroline’s, depending on the comedian. Then you’ve got to go to K-Town, Koreatown, for some karaoke and kimchi. I’d suggest a place but part of the point is to get lost in translation—to end up at some random karaoke joint where they tell you “fourth floor, on the left, booth No. 29!” Nothing beats being a foreigner in the city where you live. You discover something about your own home.